What is it about ice skating that seems so magical and romantic? It&apos;s the most popular sport in the Winter Olympics, garnering more viewers than other sports combined. We&apos;ve all ventured to Rockefeller Center during the winter to see ice skaters glide and twirl and, well, occasionally, fall on their rears. Ice skating can be a perilous activity for the uncoordinated. And yet we love it. Maybe it&apos;s something akin to flying - so graceful and light, and freeing for both practiced participants and observers. Almost a million people have skated here since The Providence Rink opened in 1998. If you skate, let&apos;s go. If you don&apos;t skate, let&apos;s go. The Providence Rink at the Bank of America City Center in Kennedy Plaza has 14,000 square feet of ice - that&apos;s twice the size of that dinky rink in Manhattan. So no excuses. 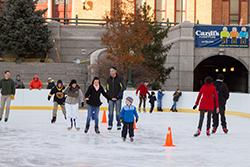 The Providence Rink is a romantic, fun landmark that you really need to take advantage of. They offer lessons, too, and you can rent skates right there. And yes, there&apos;s a waist-level partition that you can hold onto the entire time, until you get the hang of it. There&apos;s no more joyous activity for you and yours. So get to it: glide, twirl, fly. Hours of operation are Monday through Friday, 10 a.m. - 10 p.m., and Saturday and Sunday, 11 a.m. - 10 p.m.
Watch below for some helpful tips on skating with Wendy Whitman of the Warwick Figure Skaters along with the PWCVB&apos;s Brian Hodge. Ann Martini left her decade-long job as an editor at Rhode Island Monthly magazine to start her own business and to teach writing at the University of Rhode Island and Johnson & Wales University. She co-owns Providence/Newport Gourmet Tours with her husband Michael, and together they are the food editors at GoLocalProv.com and are writing a book about the history of Rhode Island food. Ann has traveled to 41 of the 50 states and insists that Rhode Island has the best-looking people, the coolest history, and the tastiest food.